Abstract Quinteros, E; Ribó A.; Jovel R.; Orantes C.;López D.
Abstract Ribo A. (Pres), Mejia R., Quinteros E., Lopez. A. Orantes C. Jovel R. Valladares E., Lopez, D.
Open Community is a generalization of the concept of OpenSource and OpenContent to other collaborative effort. The term “open” for an open community refers to the opportunity for anyone to join and contribute to the collaborative effort. The direction and goals are determined collaboratively by all members of the community. The resulting work (“product”) is made available under a free license, so that other communities can adapt and build on them. In this context the “product” of the open community is an “improved public health by application of space technologies”. to accomplish the objectives of the Open Community. Especially for Capacity Building Programmes Open Source and Open Content are denoted as Open Educational Resources. The Open Content and Open Source Software applied for Public Health Risk Mitigation are Part of Joint Repository of Resources. Open Community Approach & Access to Knowledge and Publication Channels have Implications for Non-OpenAccess & OpenAccess Journals. Green Open Access (see ArXiv-Comment) in context of >>Versioning allows to see "Who contributed what and when" e.g. on >>GitHub. 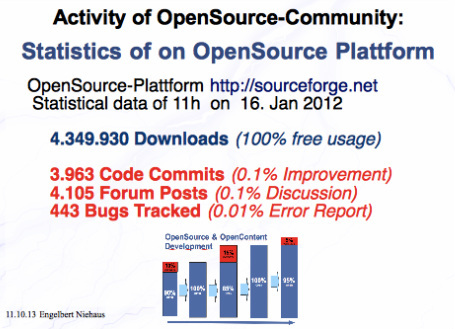 According to statistics on OpenSource Portals only 1 out of 1000 users/scientists/... of Open Source software will contribute to improvements, like bug tracking, code commits or documentation of the software. So AT6FUI will remain most likely a small community of people that donate their labor force to Public Health Risk Mitigation. This can be improved if the Open Community Approach is an integrated policy of Public Health Agencies, Academic institutions and Funding Agencies for Projects, so that results for Public Health Risk Mitigation can be modified and shared freely among UN Members states. If the financial constraints could be reduced towards low cost more people can benefit from risk mitigation strategies and the impact of the low cost resources might be higher on Public Health, even if the efficiency of a single application of resources might be less in comparison to commercial solutions.